HEDD may be a new venture, but the man behind it is no neophyte — as the company’s debut design proves! 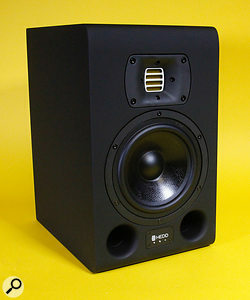 Launched in August 2016, the Type 07 is one of two initial studio monitor products (its smaller sibling, the Type 05, is the other) from Berlin-based debutantes Heinz Electro-Dynamic Designs — HEDD for short. 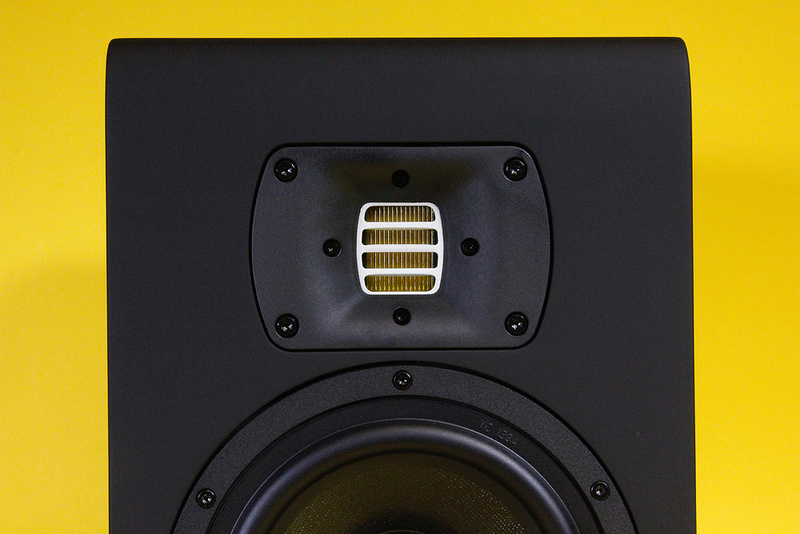 In actual fact, HEDD are not exactly newcomers to monitor design and manufacture, if only because their founder and chief executive, physicist Klaus Heinz, was the co-founder of and (until he left the company in 2014) head of R&D at Adam Audio, the Berlin-based manufacturers of studio monitors whose products have featured multiple times as winners of the monitor category of the annual SOS Awards. 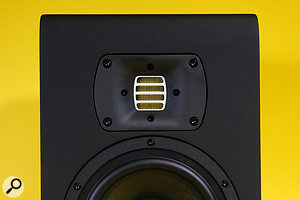 The success of Adam Audio’s monitors was in no small part due to the company’s highly-regarded signature Accelerating Ribbon Technology (ART) tweeters, designed and developed by Heinz, which built upon the Air Motion Transformer (AMT) concept developed in the early 1960s by German-American physicist Oskar Heil (1908-1994). The new HEDD Type 07 and 05 monitors feature Heinz’s latest evolution of his Air Motion tweeter, the HEDD AMT. The Type 07’s cabinet is a stylish, sturdy construction whose soft-touch surface gives the monitor a distinctly modern feel. 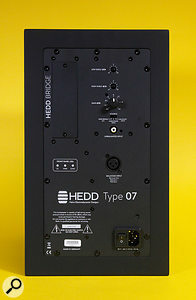 The HEDD AMT tweeter sits in a new waveguide that allows the use of a lower crossover frequency, and the seven-inch mid/woofer is a new design whose honeycomb-sandwich diaphragm is said to incorporate the latest resin technology to make it around three times stiffer than similar previous designs, thereby increasing the accuracy of the reproduction of mid-range and bass frequencies. Twin front-facing, circular reflex ports and a three-LED indicator panel complete the front baffle. The rear of the cabinet is almost entirely occupied by the metal chassis plate that carries all the 07’s controls and connectors. Analogue audio enters the 07 via either a balanced XLR or an unbalanced RCA phono, and a blanking panel covers the substantial slot in which optional HEDD Bridge D-A input cards can be fitted, giving you (when all are available) the option of connecting digitally to the 07 via USB 2, Wi-Fi, AES3, Dante Audio and AES67 Ravenna Network. All three audio inputs, balanced, unbalanced and digital, can be connected simultaneously, as a rear-panel selector enables you to switch between them. The 07 contains no DSP, its tweeter and woofer being powered individually by two 100W variants of the latest generation of ‘ICEpower’ analogue Class-D switching amplifiers. The rear panel houses the inputs, EQ controls, and a blank slot into which can be installed a variety of digital input options.There’s a level control — a pair of Type 07s will deliver a maximum peak SPL of 116dB at 1m, so you’ll need it — and there are high- and low-frequency shelving response controls (with corner frequencies of 2kHz and 200Hz, respectively), which give you ±4dB of adjustment at 20kHz and 50Hz to help more closely match the response of the 07 to your listening environment and/or your personal preferences. The 07’s frequency response is given in the manual as 38Hz to 50kHz (without defined parameters), alongside the infinitely more honest figure of 45Hz to 20kHz (±1.5dB), which gives the shelving controls a very creditable base to start from. Incidentally, the Type 07 has a switch-mode universal voltage power supply so, if you are in the fortunate position of being able to travel the world with your 07s, you won’t have to worry about voltage conversion — you’ll just need a selection of suitably plugged IEC leads. Since no HEDD Bridge digital interface cards were supplied with the review units, my listening tests were conducted using only the analogue inputs, which were fed directly from either an analogue console or from the outputs of a D-A converter via a passive attenuator. My initial impression of the HEDD Type 07 was of a sense of restrained power delivering a sonic performance that felt smooth, superbly controlled, transparent and highly detailed. With electronic music tracks from the likes of Deadmau5 and CoH, the 07 delivered extension, punch and clarity in the low bass without ever sounding stressed and, at normal monitoring levels, without any unwanted artifacts from the twin reflex ports. The response, definition and dynamic precision delivered by the new mid/woofer from the low bass all the way up to the 2.3kHz crossover point were extremely impressive, suggesting that the combination of the new, stiffer-coned mid/woofer and its ICEpower amplifier is performing as intended. In common with all of Klaus Heinz’s recent designs, the Type 07 employs a folded-ribbon tweeter design.Since I own a pair of ADAM A77X monitors — which are fitted with the Adam X-ART tweeter, Klaus Heinz’s last evolution of Oskar Heil’s concept before he left that company — I was looking forward to hearing the new HEDD AMT tweeter. The one thing to state at the outset is that a direct comparison between an X-ART tweeter driven by a 50W Class-A/B amplifier, and an HEDD AMT driven by a 100W ICEpower analogue Class-D amplifier is an exercise in futility. Both setups perform superbly and I could work happily on either. Both deliver accuracy, dynamic detail and transparency in the upper mid-range and high frequencies, with the HEDD AMT, to my ears, sounding a little more controlled in nature, whilst the X-ART seemed slightly more unruly — but we’re getting into the realm of miniscule subjective differences, and I’m starting to sound like a hi-fi reviewer. In their intended role as nearfield studio monitors, the HEDD Type 07s are not going to hide anything from you and should enable you to make well-informed tracking and mixing decisions. The detail and transparency that the AMT tweeter can deliver is absolutely ruthless in revealing anything amiss in the higher frequencies, whilst the depth, clarity and precision that its lower-frequency companion is capable of mean that you’ll have all the sonic information that you’ll need to make decisions in that area. The Type 07 is also a monitor that is easy to listen to, allowing you to work with it over long periods without tiring you out — a major advantage in my book. One small point to note: the volume, power on/off and source-selection controls are all on the rear panel, which, depending on your setup and workflow, may or may not be a slight inconvenience. For me, the HEDD Type 07 not only delivers a sonic performance that is of an extremely high level, but also is that rare combination of being easy to listen to whilst also being transparent and analytical — it hides nothing, adds nothing and reveals everything. The optional HEDD Bridge digital interface cards not only give you AES3 and USB 2 connectivity, but also add an extra level of audio-over-IP functionality that may be slightly ahead of its time as far as the home and project studio markets are concerned, but which may find more immediate acceptance in the professional and installation markets. Choosing a monitor is an intensely personal process in which you have to find the balance between budget, performance and application that works for you. With that in mind, to me it is no coincidence that loudspeakers equipped with AMT tweeters and designed by Klaus Heinz have won the SOS Awards Best Monitor category in four of the last six years, and I certainly won’t be surprised to see these HEDD monitors challenging for that position in the future. An essential addition to your audition list should you be in the market for new monitors anywhere near the Type 07’s price. Berlin is a bit of a competitive hotspot when it comes to the seven-inch woofer/AMT tweeter market, and you’ll find direct competition from the other two companies based in that city — Adam and Eve — albeit with differences that make comparison with the HEDD Type 07 a matter of audition, rather than specification. From the US, PreSonus and Fluid Audio have similar offerings, the PreSonus featuring an eight-inch woofer and Fluid Audio having the AMT tweeter situated coaxially in a seven-inch woofer. Easy to listen to whilst being impressively analytical. Optional digital interfaces add AES3 and USB 2 connectivity as well as audio-over-IP functionality. Well-priced for the performance on offer. None, other than the rear-panel placement of the volume, power on/off and source select controls. An impressive debut from a new company founded by a pioneer of AMT tweeter development, the Type 07 combines a smooth, controlled sound with a highly detailed, analytical performance across the audio spectrum.